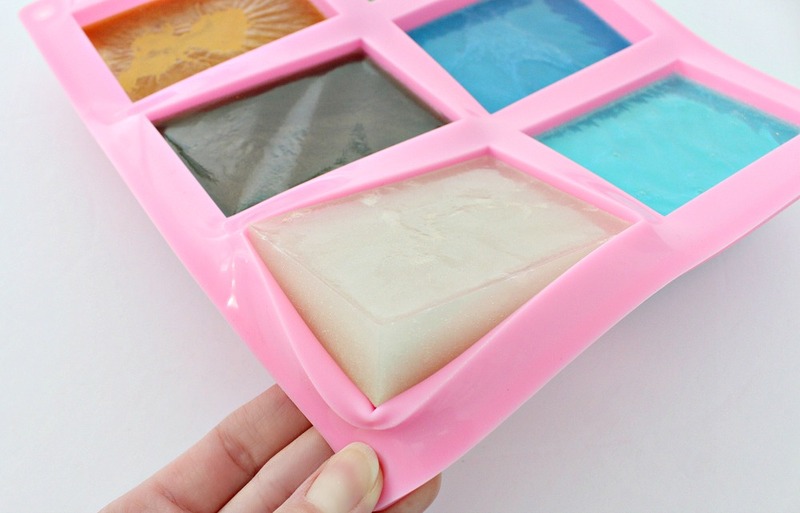 I think you are going to LOVE today’s DIY gemstone soap tutorial! 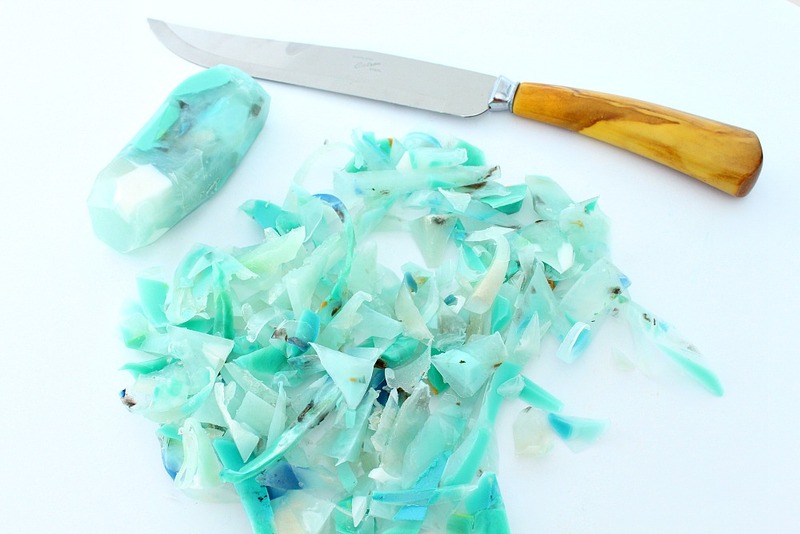 It’s easy to make, looks gorgeous, and it’s something that can be used and enjoyed. As a rock collector, you can imagine how much I mooned over the gem and mineral shaped “soap rocks” when I first spotted them in an artsy boutique in Duluth, MN. They were regularly price at around $11, so you can imagine my glee when they were put on clearance one day – for $6 a bar! Still pricey, but I ran to the cash register with an armful. 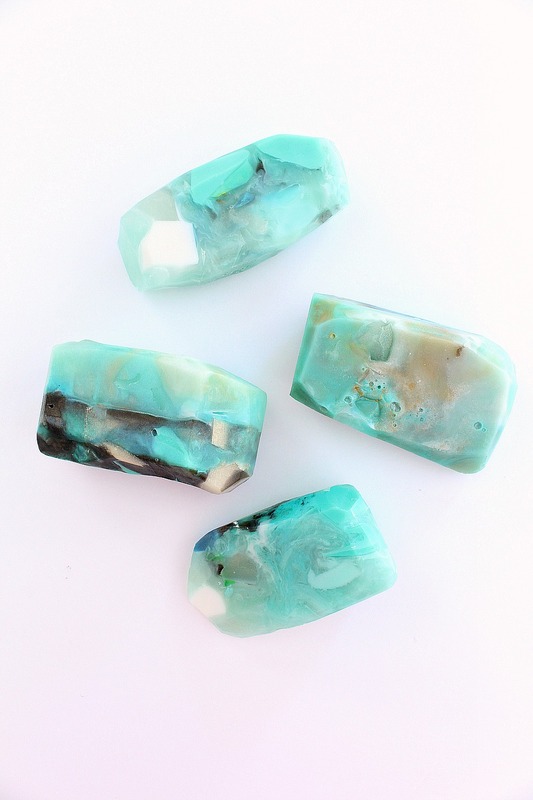 I bought a couple as gifts and then depleted the store’s stock of “turquoise” soap rocks, which I’ve doled out to myself over the years. You might have seen them pop up in this bathroom and that bathroom. I swear it wasn’t the same soap, moved from room to room. ingenuity or quality but they’re just too expensive for me to enjoy (does that make sense to anyone else? ), no matter how much I appreciate the ingenuity and beauty. 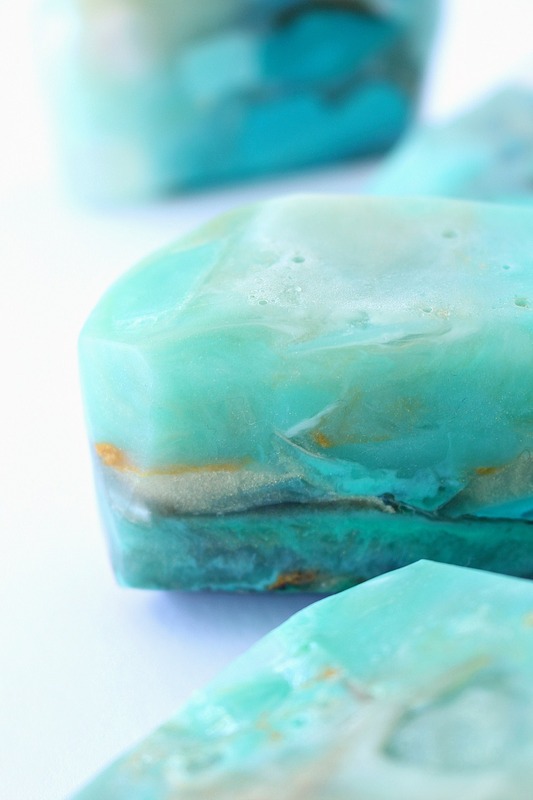 When I started seeing gemstone soap tutorials popping up everywhere, I decided to make my own soap rocks. 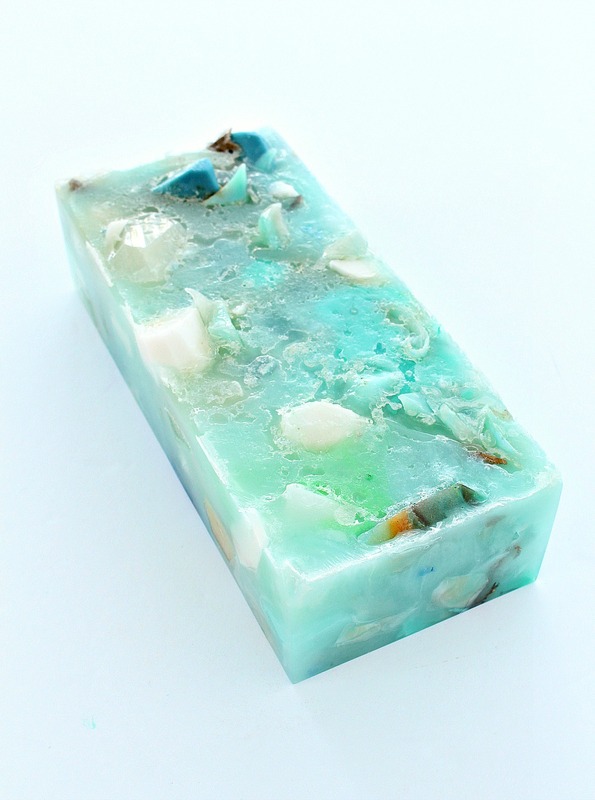 My DIY gemstone soap is nowhere near as gorgeous as the original soap rocks, but at only $2 a bar (which will be less once I make more batches and the cost per use of the molds I bought is lowered), my wallet is much happier – and I don’t feel a twinge of guilt when I’m lathering up. Plus, making soap turned out to be such a fun and easy craft project that I can’t wait to make more! 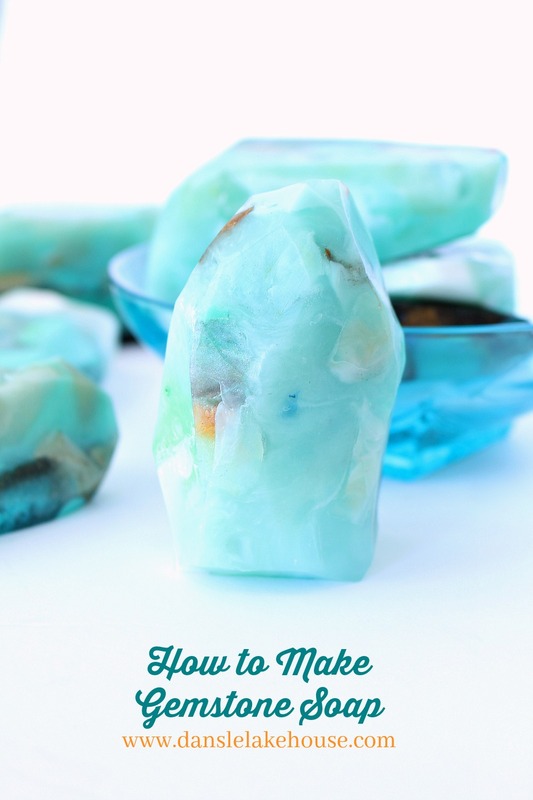 Although there are a lot of great DIY gemstone soap tutorials online (like these ones by A Beautiful Mess, Dream a Little Bigger, Fall for DIY, Honestly WTF, Soap Queen, and DIY in PDX), this tutorial is my favorite and it’s the one I followed because it created the most realistic looking soap rocks. Essential oils: I read that vanilla can yellow a soap so if you’re going for a really clear “gem,” opt for another scent. Glycerine soap bases: In total I ordered 7 lbs of glycerine, which yielded two huge silicone molds worth of soap. I linked to the exact glycerine bases I used because they are really nice. I chose organic glycerine and was really happy with how this particular soap base lathers. The clear looks so gem-like, so I ordered even more of it. If you’re only going to order one (the opaque or the clear), get the clear. 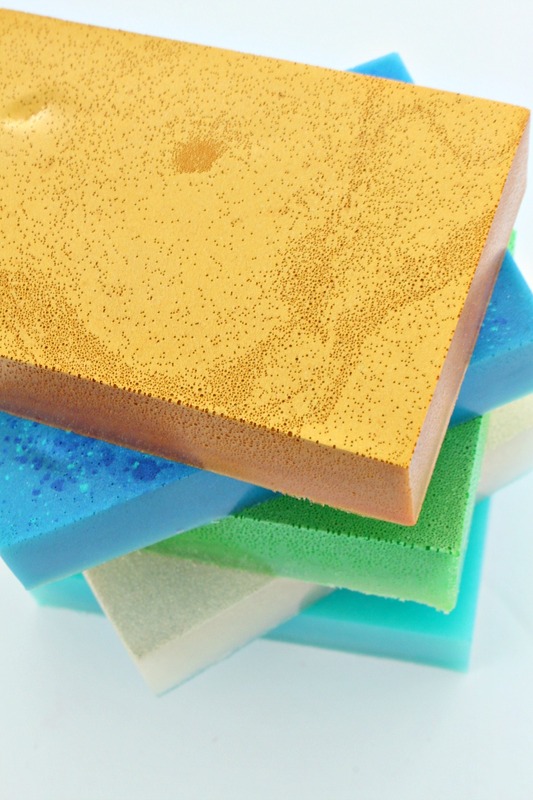 Cosmetic grade mica dyes: Mica colorants bestow the shimmer and sheen of real stones and help make these gem soaps more realistic. I think I went a little overboard with the dye and made mine too richly colored, so play around a little with the quantity and add a little to start, building up the color if required. For my next batch I’ll try more faintly tinted clear glycerine areas for a more “quartz” inspired look. The exact kind of mica I used is no longer available but I linked to a similar one. Buy any kind you like, but make sure it’s cosmetic grade. Or try what Rachel did and put those unused eye shadow kits to good use! 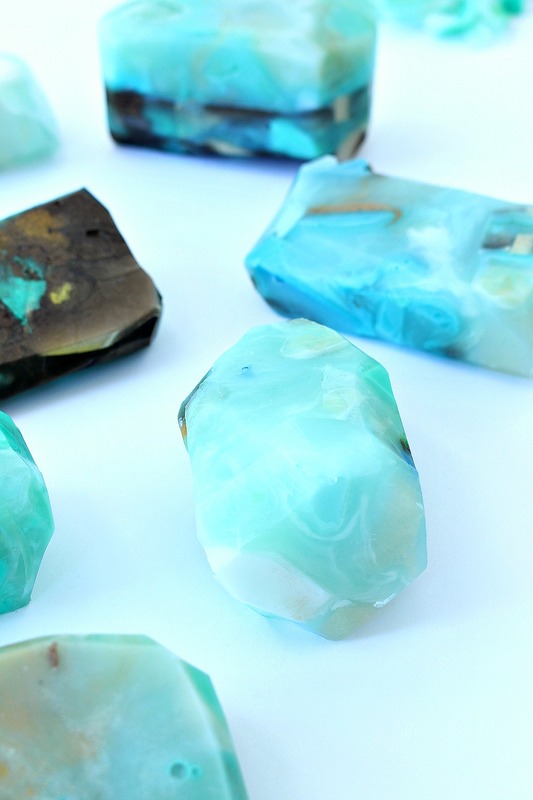 The only tricky part is creating a realistic gem, so the first step with making rock soap is to figure out what kind of stones you want to make. Hit up Pinterest (I have a entire board dedicated to rocks) and find at least one kind to mimic. 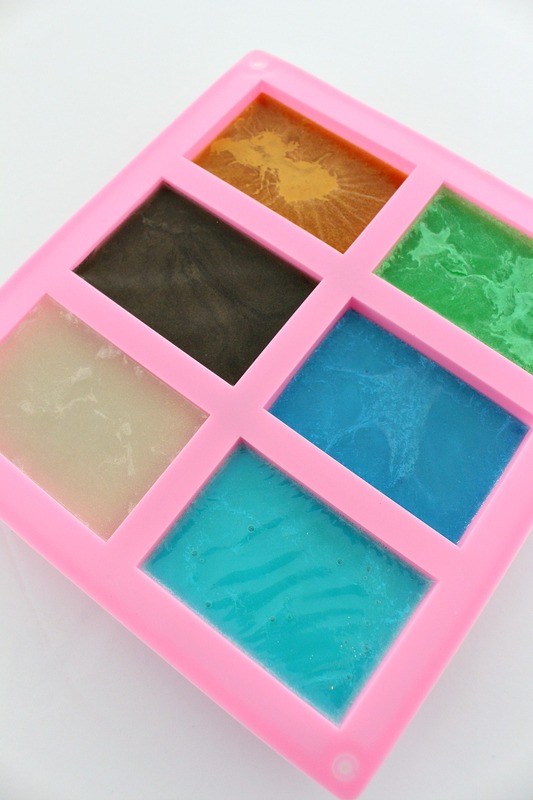 Take a close look at the veining and colors to determine what colors of soap you’ll need to make, and how to layer the different pieces – but there’s no right or wrong way to do this. 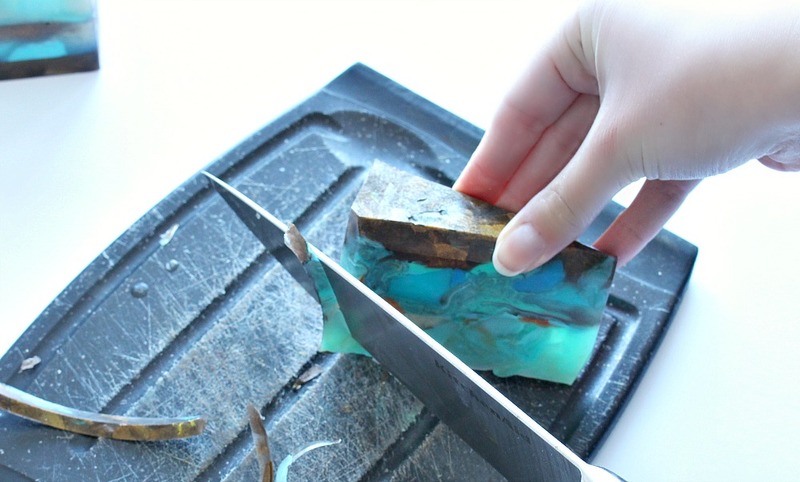 With your rock soap “design” sorted, here are some more detailed instructions for how to actually make melt and pour gem-shaped soap. 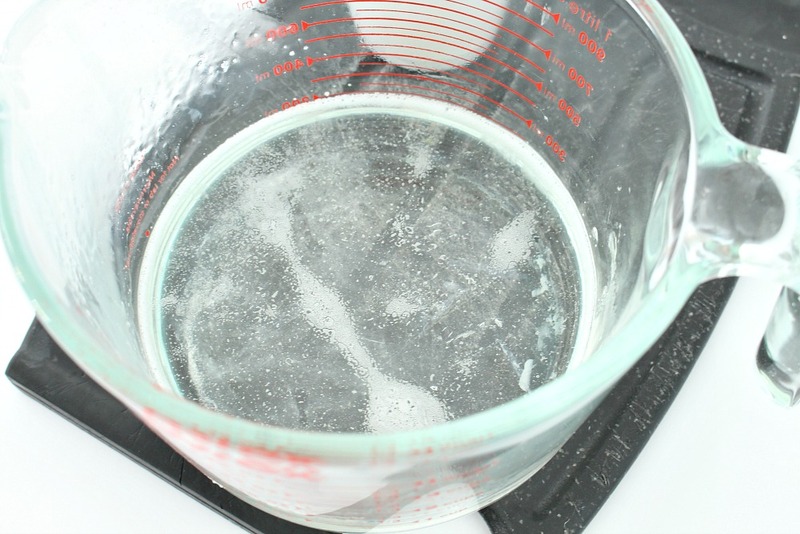 Cut up the glycerine into small pieces and place in the microwaveable bowl. I worked with a cup or two at a time. Pop into the microwave and melt (about 30 seconds – 1 minute, depending on the microwave). 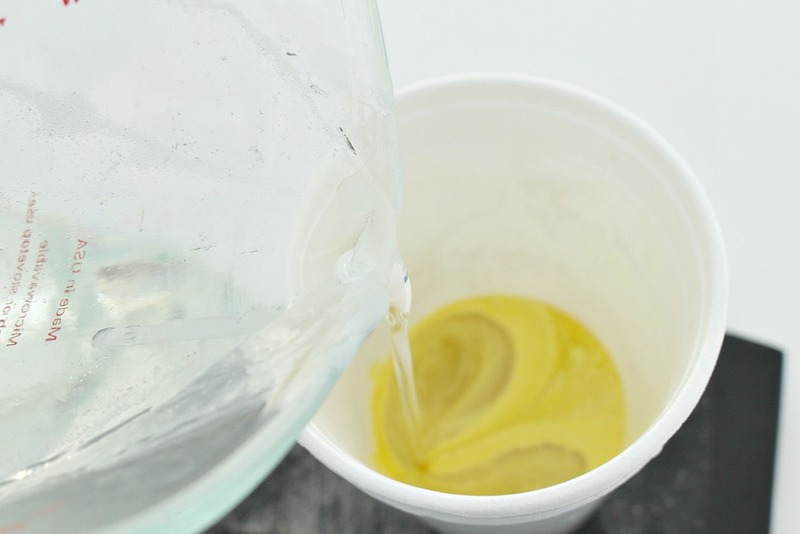 Mix in a pinch of mica until the color is perfect and then add essential oil. I added a few drops of oil at a time until it smelled great – it’s a personal decision how much to add. 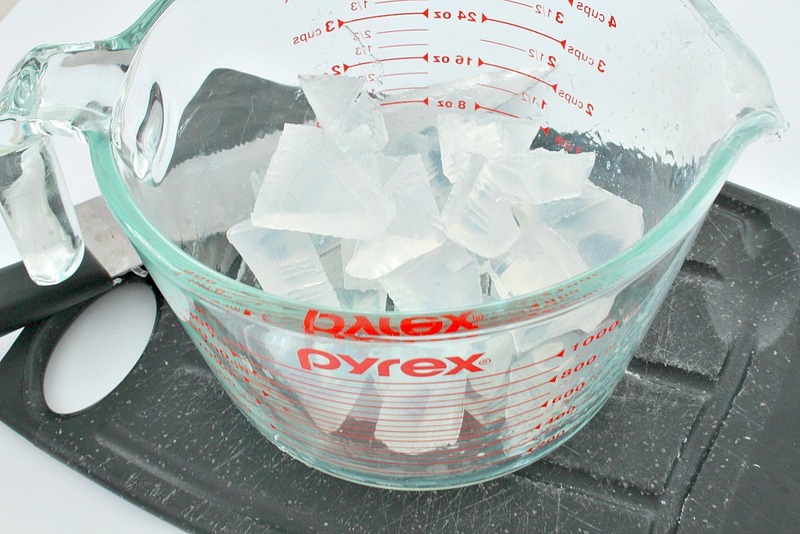 If you’re going to be making many colors, you can also pour the melted soap into another container, add dye and oil, and then pour into mold to keep the Pyrex measuring cup from transferring dye across batches (like I did, below). Pour the melted glycerine into the bar mold and let cool 6-8 hours. In the meantime, start on another color and repeat the process. 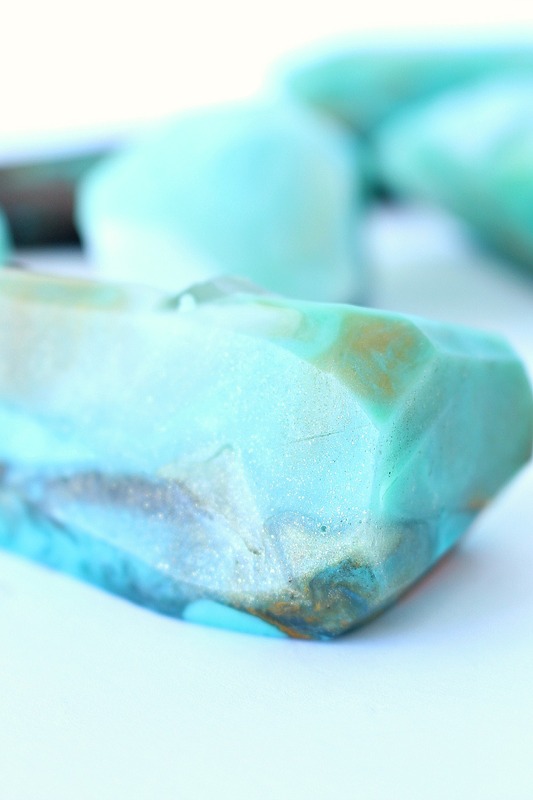 You want to have a nice variety of the colors present in your gem or mineral. I spent a couple of hours leisurely making different colors; it was a relaxing crafternoon. You can also use an assortment of random plastic containers, but the bars pop out of this silicone bar mold so nicely. I bought it because I figured I can make rectangular bar soap later. After they’ve hardened, remove the soap from the molds. 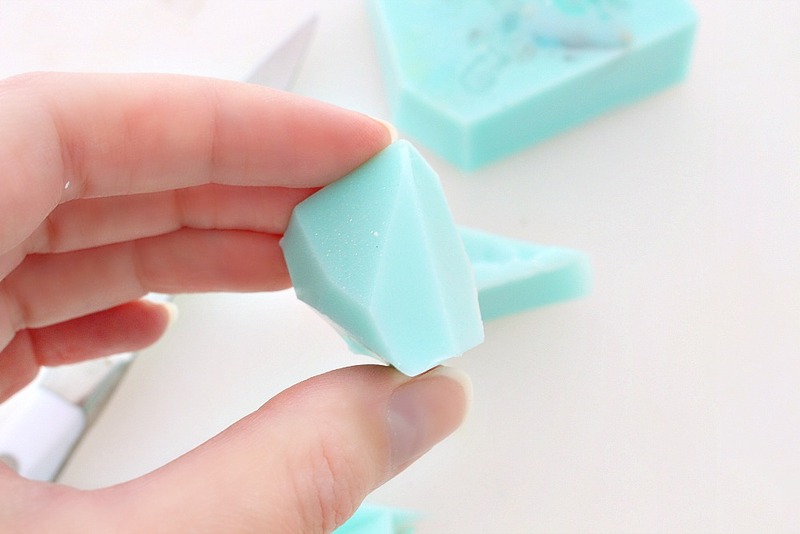 (Technically, at this stage you could also just cut these soaps into gem shapes). Now chop up those bars! Use a knife or other kitchen tools (like a vegetable peeler) to create organic looking shapes. Create bigger and smaller chunks, some shards and thin little “veins” – depending on the stone you’re trying to replicate. 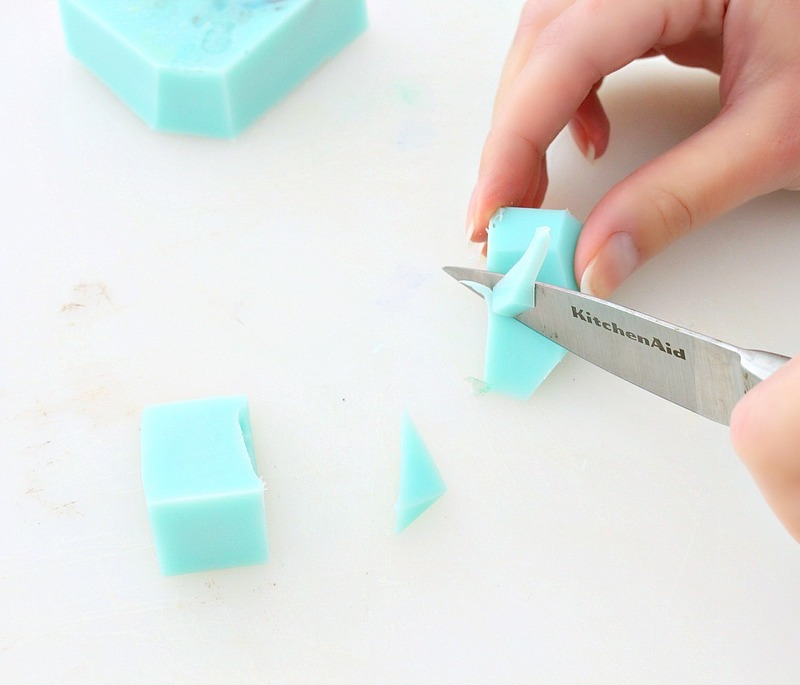 You can also gently rub the soap to soften corners. 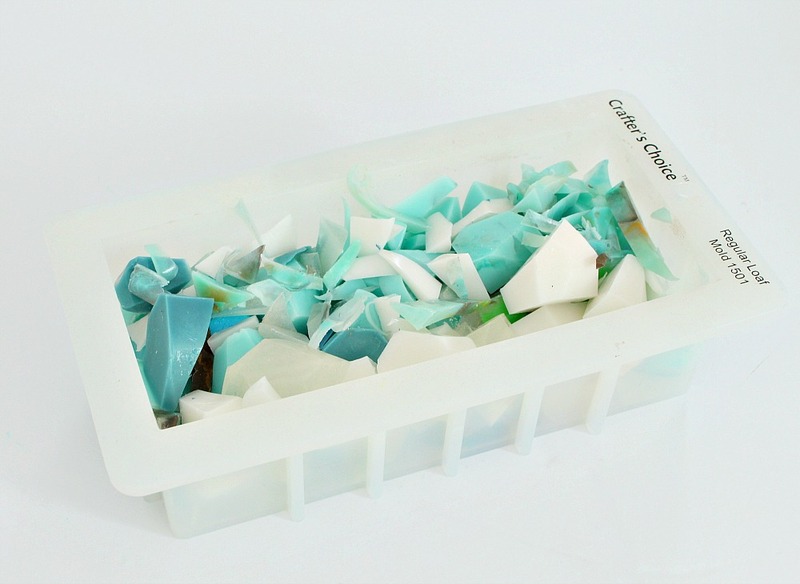 Set aside any shavings and cuttings – you can add them to a bar later or melt them again. pieces. How much you need will depend on how much room is left. Start with a cup and keep adding. If you want separation between the layers, let them firm between adding more. Let the loaf of soap set and harden overnight. For my next attempt, I plan to limit the variation of color and just play more with opacity, so the little shards and pieces I cut up will be suspended in what I hope will look like quartz. 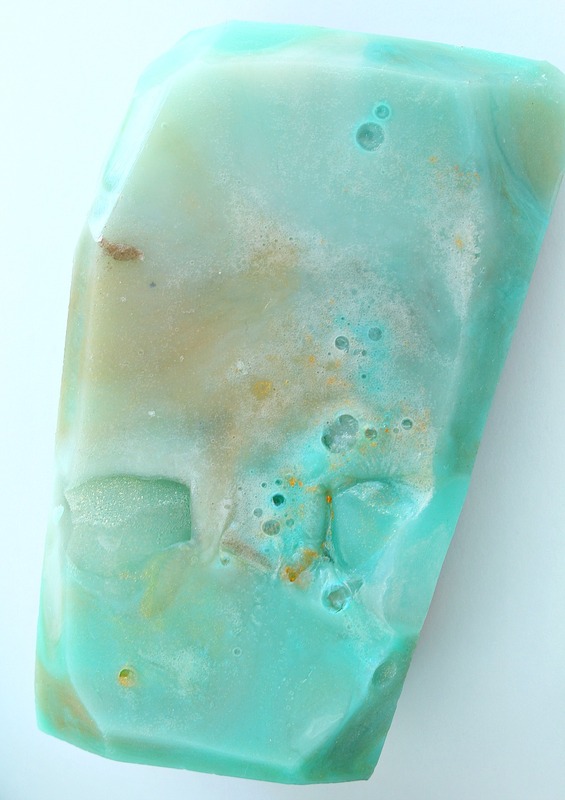 This process is fun and I promise you’ll want to keep experimenting to get as realistic a gem soap as possible. 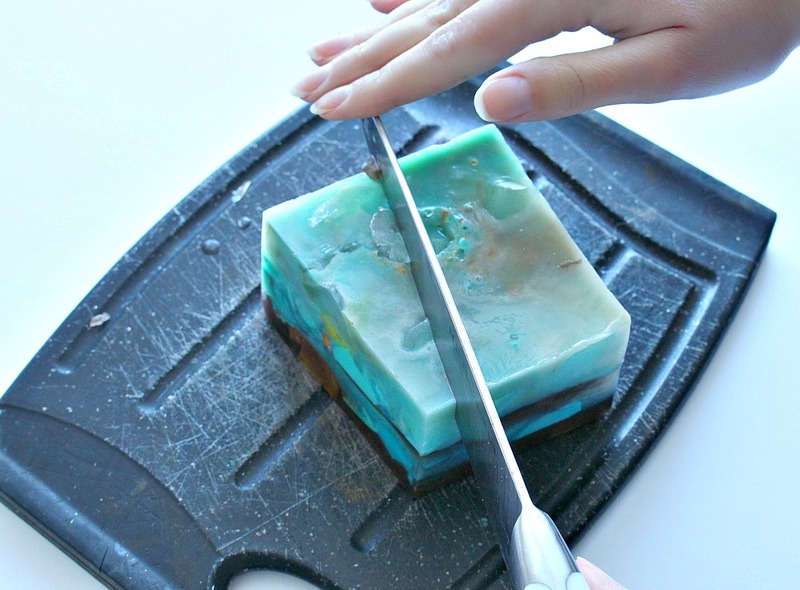 Once it has hardened, remove the soap from the mold and slice it like bread. Cut off edges and corners, and add some facets, to create a random, organic feel. Cut some bars diagonally, some square – mix it up! 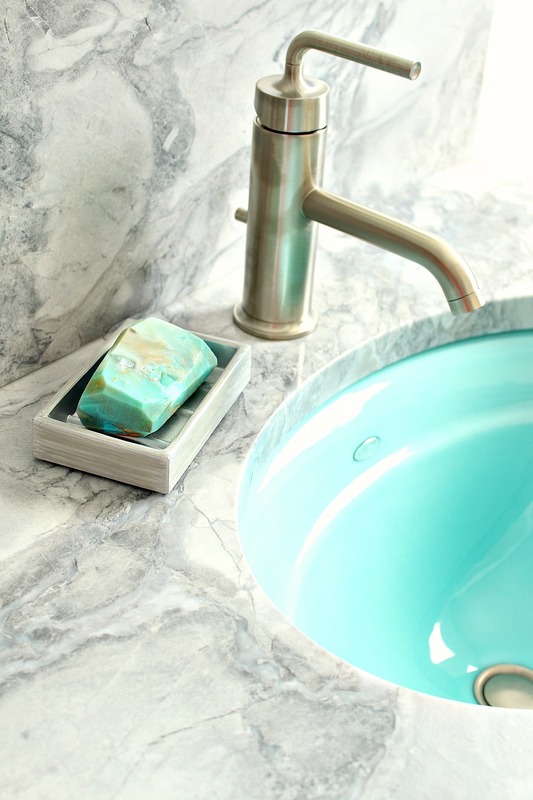 I love my DIY gemstone soap – it makes such a cheery statement on the counter in the bathroom. The colors didn’t stain or dye anything (which was my worry the first time I lathered up a bar in my brand new white tub). I also have really sensitive skin (prone to redness, dryness, and also oiliness – yay) but this soap has not dried out my skin or aggravated acne; it’s a really nice soap. 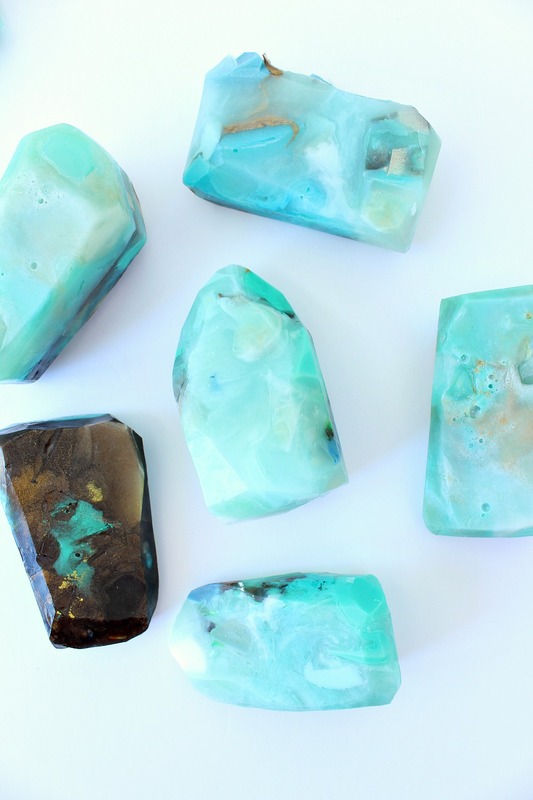 Make a batch of these easy DIY gemstone soaps for holiday gifts – bonus points for whipping up birthstones! (Or, if you’re in a rush, you can always find Soap Rocks on Amazon for stocking stuffers and make/hoard these handmade gem soaps for yourself later). 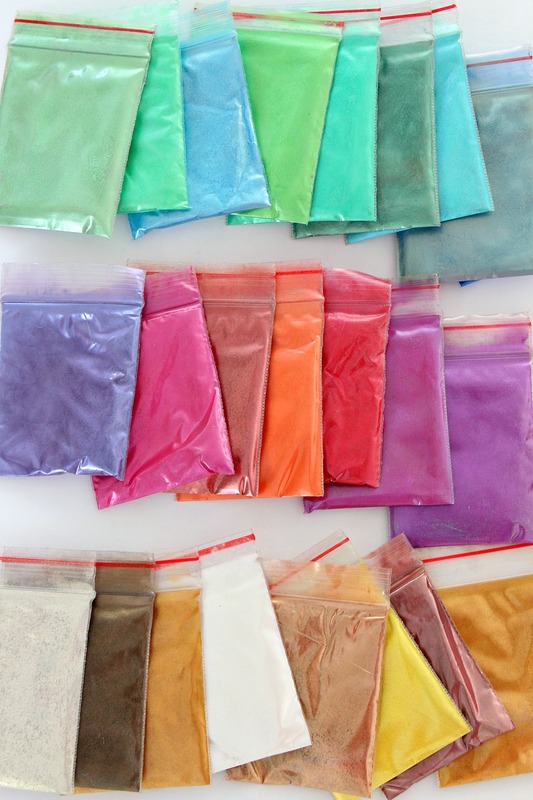 If you don’t like a color, re-melt the bar and try adding more dye (to darken) or glycerine (to lighten), or add a whole new hue and try again! P.S. 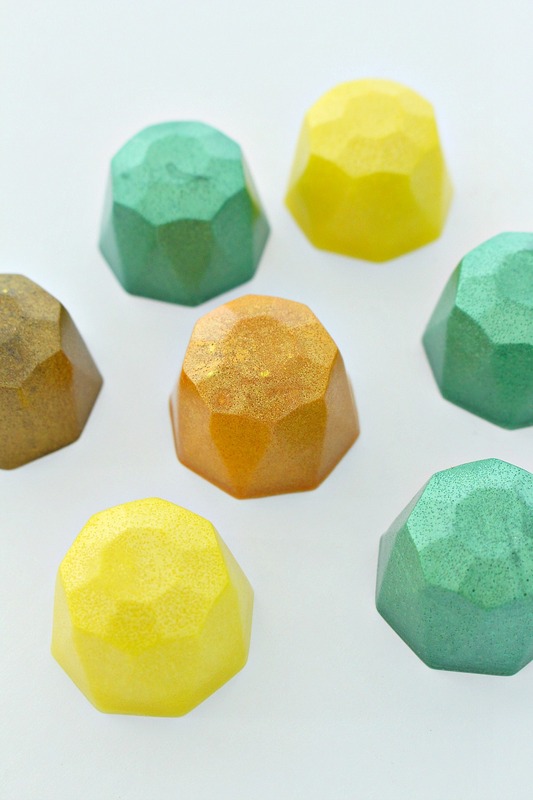 Check out my gold and crystal DIY soap rocks. 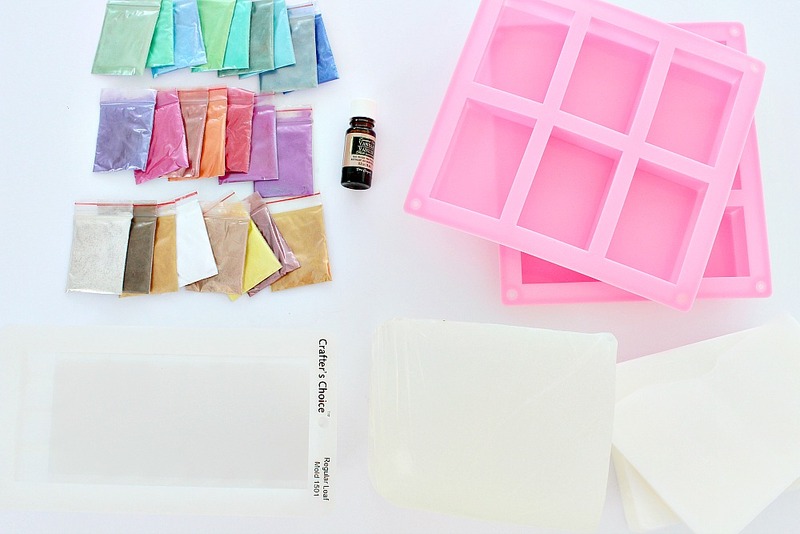 Have you made DIY gemstone soap? I’d love to see! Share a link in the comments or tag me on Instagram. Thanks Amy, so happy you like them! I just ordered everything I need for making soap. You made it look so easy! I have had my fair share of diy failures so wish me luck! Great Christmas gift idea. Thanks Tanya. The framed Agate art was apparently too hard for me (I bought the slices and never did anything more, haha) but this looks more fun! My husband is a geologist so I'm always on the lookout for rock stuff :)Yours turned out beautiful. Oh no! Well, those slices make perfect coasters, as-is. Call them DIY coasters and call it a day, haha. I have a closet full of discarded projects, so I totally understand. 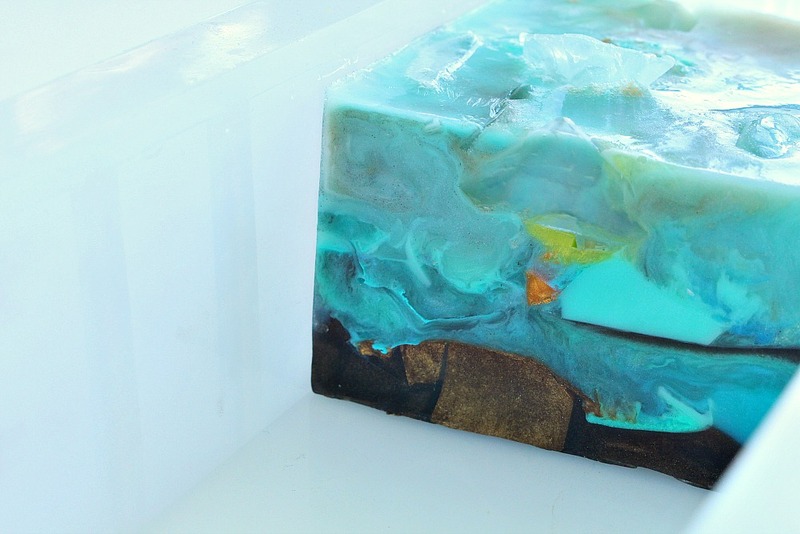 If your Hubby is a geologist, he'll be able to help make amazing soap. I read somewhere that the folks who created soap rocks were geologists and that's how they created such realistic soap stones. Hubby might be an excellent asset for this craft! This looks absolutely marvelous! It seems like a nice project to do together, or a perfect afternoon all to oneself! Thank you! Definitely, it would be a great craft to work on with someone but it's also kind of a peaceful project to tackle alone. 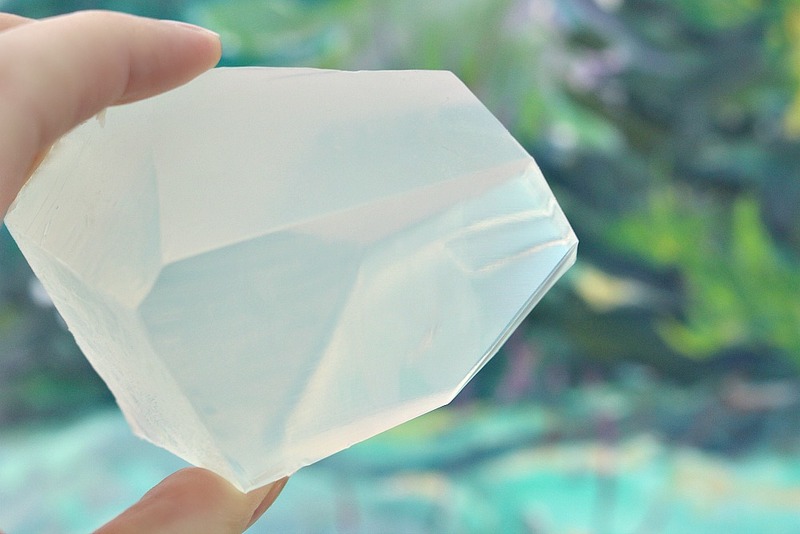 I am a minimalist so I would probably make the monocolored gemstone using my diamonds silicon ice cube tray. They will be perfect for my guest bathroom. Glad to hear that they didn't stain, but not sure why they didn't since its still dye sitting on a surface. Maybe your new tub just has a great finish on it. But I do worry about my sink counters as they are rather old and possibly porous. Although I wouldn't know for sure since I am obsessive about keeping anything that could stain, off of it.Anyway, love your soap rocks. Your plan sounds lovely!The weird thing about the mica dye is that the soap lathers white, not colored. I've never worked with soap before so this is all new to me but it seems like the glycerine traps it somehow. Bath bombs made with it can definitely stain tubs (I've read), but with the soap there wasn't even any color released when it's used. It never stained my stone counter, which did stain when a strand of my freshly dyed hair fell on it and sat in water for too long (crap). But if you're worried about your counter, then it would be a good idea to avoid colorants of any kind. 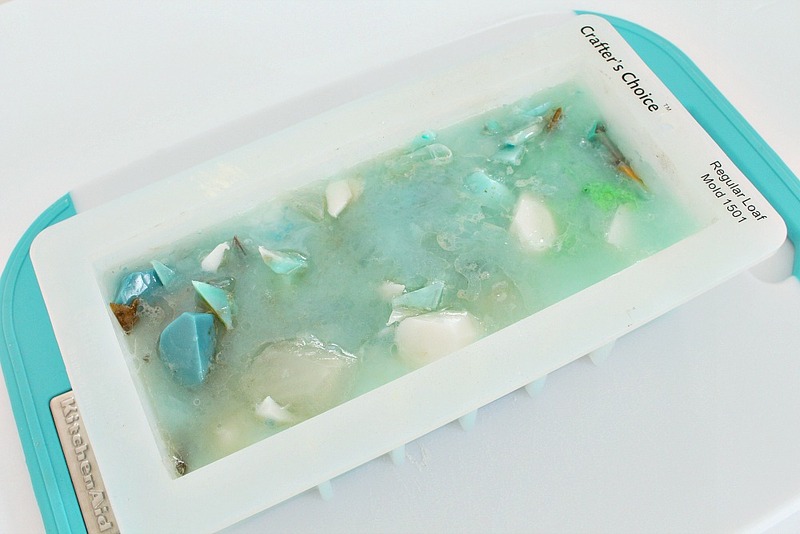 The glycerine on its own is gorgeous and in your mold with a lovely fragrance, this would still be a really nice soap. 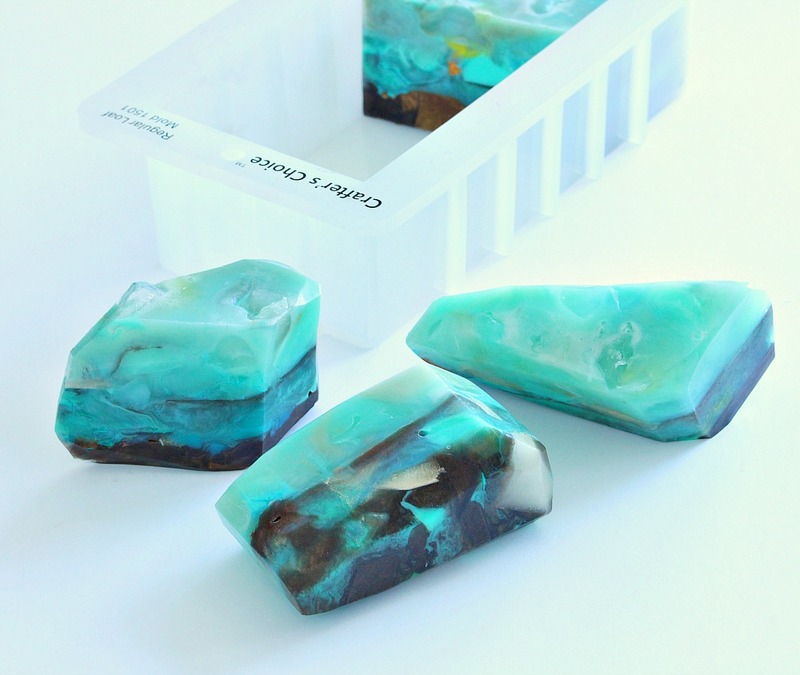 these are very pretty…you can remake bars of soap that way using left over soap slivers…I'm very old and thrifty. Thanks for posting on hometalk. I saw these also and wanted to make them, just not sure but I guess my idea was pretty close to how you did them. Thanks again. I'll have to order a few more things to get started. I think they are so pretty.